Regardless of where you live the weather can have a negative effect on your Shihtzu. Due to this fact, it is essential that you know what to be aware of when different elements occur. Keep him indoors -On exceptionally hot and humid days, keep your dog indoors as much as possible. Shade – If he must be outside, make sure there is a nice shaded area where he can rest. Cool, clean water – Make sure he always has plenty of cool, clean water in his bowl. Also ensure that your Shihtzu has access to this water both when he is inside and outside. Rest – Make your dog rest during exercise or play sessions. You don’t want him to overheat. Sundown – Exercise your dog before sunrise and after sunset to avoid the hottest points of the day. Pests – The hottest points of the summer is when your Shih Tzu dog is at the highest risk for heartworm (caused by misquitos) fleas and ticks. Make sure he has all of his vaccines and preventative medicines, and keep him away from areas where these insects like to make their home. 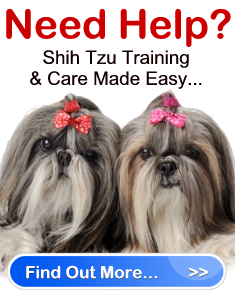 Hot paws – Hot pavement, gravel or sticky tar can cause your Shihtzu foot problems. If your dog has tar on his pads, rub the area with petroleum jelly and then gently remove the jelly with gentle soap and water. Rinse the feet well. Heatstroke – Heatstroke is an extremely dangerous condition that can result in serious debilitating problems in your dog and even death. Some signs of heatstroke include excessive heavy panting, rapid heart beat, dry skin, muscle weakness and collapse. If you suspect heatstroke, place your Shihtzu in the shade or take him inside. Give him small amounts of cool water and apply cool water all over his body if at all possible. Take him to the Vet right away. No car ride – Don’t take your dog for a car ride on really hot days, and NEVER leave him in a car on hot days. Cold paws – Remove any salt, packed snow or ice that may be trapped in your dog’s paws from being outside. Note: Invest in doggie boots to keep your Shih Tzu’s feet dry and protected. Keep him indoors – On exceptionally frosty days limit your dog’s outside adventures. Only take him out when he needs to eliminate and exercise him inside as much as you can. Keep his energy levels high – If it’s a nice winter day and your Shihtzu would love to go out, make sure you feed him some extra food before going out for a nice long play or exercise. It takes up plenty of energy for your dog to stay warm, and food fuels energy. Note: Do not feed your dog extra amounts of food unless you will be taking him outside for a long time. If he doesn’t need the extra energy, he’ll only become overweight and unhealthy. Dampness is bad – Winter is a very wet season, which can be bad for your dog. If the coat of your Shihtzu becomes wet, make sure you dry his coat so the coat doesn’t hold in the dampness and give your dog a chill. If you must, use a hair dyer to make sure he is dry. Note: To help your Shih Tzu stay dry, put a fitted dog coat on him. This will also help to keep him warm. Fireplace Safety – If you have a fireplace and you like to light it during the winter, you must train your pet to keep a safe distance from the fireplace as you won’t want cinders or fumes to hurt the dog. Frostbite – If you suspect that your Shihtzu has frostbite, do not rub their skin to try and get it warm. Take your dog to a warm place and apply warm, moist towels the area(s) on his body that are frostbitten. Change these towels until they become flushed. Take him to the Vet right away as severe frostbite can cause serious conditions in your dog. Finally, you should also be weary of storm weather. You should never leave your Shihtzu outside or take him for a walk during lightning storms or when it is extremely windy. In extreme wind conditions, your dog can be hit by flying debris. Essentially, if you wouldn’t want to be out in extreme weather, neither does your dog.